For this article I am using Microsoft Dynamics GP 2015 R2 and Dexterity 14.00.0084 which comes on the DVD image. I have copied a clean Dynamics.dic from the application folder into a subfolder in the Dexterity folder. I opened the dictionary with Dexterity and selected Debug >> Test Mode (Ctrl-T). 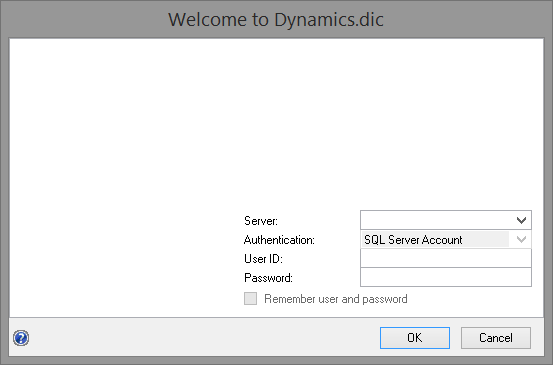 The first error I get is “You need to run Dynamics.dic Utilities before you can run Dynamics.dic. Do you want to launch Dynamics.dic Utilities now?“. Note: The name of the dictionary (in this case Dynamics.dic) will be whatever your development dictionary file is called. This issue is has been around since the beginning and is because the Dynamics code is looking at the Dex.ini file for the settings INITIAL and SYNCHRONIZE and unless it can find those set to FALSE, it will think that it is the first time Dynamics GP is being launched and ask to go to the Utilities to set up the databases and synchronize the dictionary to the account framework. Change DexHelpPath to point to the Dexterity folder. Clicking OK and the Login window opens, but it is not fully drawn. The problem here is that script that reads the ODBC Data Sources for the Server drop down list is trying to call an external library. This library is part of Dynamics GP, but not actually part of Dexterity and so is not installed. Solution: Copy the GPDWIN32.dll from the Application folder to the Dexterity folder. This issue started from Microsoft Dynamics GP 2010 onwards. Launching Test Mode again and I can login, but get another error just after login. The error is “Could not load file or assembly ‘Microsoft.Dynamics.GP.BusinessIntelligence.Homepage’ or one of its dependencies. The system cannot find the file specified.“. This issue was introduced with Microsoft Dynamics GP 2013 when the homepage was changed. Note: GPIcons.dll is also needed for Dexterity for GP 2010, GP 2013 (& R2) and GP 2015 (& R2) to allow the toolbar and area page icons to show correctly. Now you should be good to go. Good luck. Hope this article helps make your life easier. 01-Oct-2015: Added note about copying GPIcons.dll so that icons show correctly. You’re a treasure. I don’t know what the GP developer community would do without you. So please, no skydiving, free climbing, base jumping, bull running, hang gliding, big wave surfing, or helicopter skiing. Great article – thanks! To get rid of the test mode launching error, I had to copy GPIcons.dll into the folder where the development dictionary resides rather than into the Dexterity application folder. Thanks Chuck. Though I have never needed to copy the GPIcons.dll into the dictionary folder. I just discovered that I have 2 instances of Dexterity v16 installed and was copying the files to the one that my launch shortcut was not pointing at. Oops, my mistake. For what it’s worth, copying all of the files to the dictionary folder and none to the application folder also seems to eliminate the error. That is a lot of file duplication that is not needed when you have lots of different project folders under you Dexterity folder. Absolutely amazing. Thank you so much for this you are a life saver. I’m now getting a “Cannot access this form because the dictionary containing it is not loaded.” when I try to access the employee maintenance screen in test mode. Any thoughts? My project dictionary is a copy of the dynamics.dic just renamed for this project so everything should be there I would think. The security settings for that window must be pointing to an alternate version in another dictionary. It is expected that most lookups would give this error as they are alternate windows in the Smartlist dictionary. To fix, while in test mode create a new Alternate Modified Forms and Reports ID and change the user security to use the new ID. Once again you are the man. Thank you so much for the information and quick response.